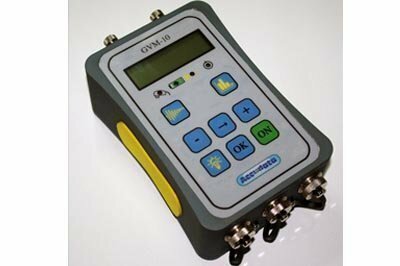 Measure ground-borne vibration from, piling, compaction, breaking or demolition with a ground vibration monitor (seismograph) such as the Accudata GVM-10, designed to comply with BS 5228-Part 2:2009+A1:2014. The GVM-10 is designed for extreme ease and it’s highly accurate but accuracy may be impaired by incorrect use. Start monitoring by placing the tri-axial sensor in position and switch on. After a few seconds, during which a self test is perfomed, the main screen appears. Pressing the bargraph button begins a monitoring session. Vibration levels and their frequencies in three axes are shown on the screen and updated every two seconds. Results are stored on an SD card and may be downloaded, viewed and printed out using the supplied software. Correct placement, levelling and siting of the triaxial geophone sensor unit is crucial to ensure accuracy. The sensor has a built-in spirit level. It must be level to within 10o and be well connected (coupled) to the ground or structure. Three ground spikes are provided for use where the ground is compacted clay or mud. They are screwed into the base of the sensor’s housing and pushed into the gound to ensure good coupling. Various methods may be used to fix the sensor depending on conditions. Direct connection of the sensor to the structure being monitored is the ideal solution but is not always possible. BS:5228 recommends placing the sensor outside at foundation (ground) level. It’s very important to make sure that the triaxial sensor is rigidly attached, as a loose connection will amplify vibration giving higher readings.